Top row Jeremy Tackis(coach), Alyssa Hawes, Jordan Martin, Caitlin Wetzel, Cara snider, Adriana Winston, Saylor Jewell, Claire Rueth, Ryley Hamilton, Tyler (assistant coach); second row Sara Quinlin, Marissa Babb, Kaitlyn Jamiel, Wilmington High, Meredith Magee, Sydni Callahan, Peighton Banks, Abigail Blac, Molly Spears , Sydney Steck; bottom row: Caroline Winch, Riley O’Brien. 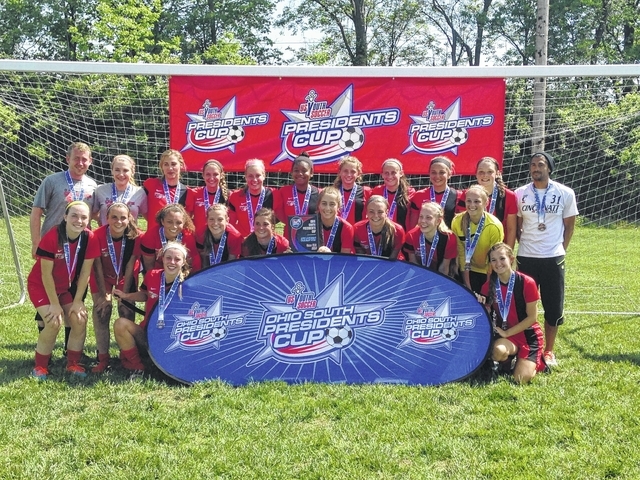 Local players took part earlier this year in the Ohio South Presidents Cup for the Under 15 Division for girls soccer. The tournament took place on Monday March, 2 and Tuesday, March 3, and saw the team coached by Jeremy Tackis of Beavercreek go on to win. Tackis’s team began group play with a 2-1 victory before a 1-1 draw in the second game. The team entered the third and final group stage game in a most win situation coming out victorious 11-0. The group then moved on to the semi finals on Monday, March 16, to take on a team they had already previously beaten twice. Tackis said he was nervous going into the game because of how difficult it can be to beat a team three times in row. They found themselves trailing 2 to 0 before a late come back in the game saw the team secure their place in the final with a late goal to win the game 4-3. Tackis said his team saved their best game for the last as they went on to the finals on Tuesday, March 17 and claimed victory with a 3-0 win, outshooting their opponents 21- 2. The team moved onto the state tournament but Tackis said the heat and lack of available players was too much to overcome as they bowed out in group play. The team features an up and coming player from Preble Shawnee, Saylor Jewel. “Saylor is a very, very dangerous player as a left forward for us, she scores a lot of crucial goals for us and a lot teams have a hard time dealing with her speed and keeping up with her,” Tackis said. Jewel scored three goals for the team during regional tournament play. Jewel was also joined during regional play by fellow Preble Shawnee teammate Oliva Rader. Rader did not play with the team during the regular season but Tackis said her ability to come in and play with a back four she had never played with before was impressive. Also on the team are Alyssa Hawes, Jordan Martin, Sydni Callahan and Abigail Black of Valley View. Caitlin Wetzel and Sara Quinlin of Centerville, Cara Snider and Meredith Magee represented Beavercreek. Adriana Winston and Marissa Babb were on the team from Xenia. Claire Rueth of Incarnation was also on the team along with Ryley Hamilton of Miamisburg. Kaitlyn Jamiel represented Wilmington High, Peigthon Banks from Springboro, Molly Spears for Bellbrook, Sydney Steck from Carrol, Caroline Winch from Oakwood and Riley O’Brien from Alter rounded out the team.